A large Iroquois war party destroys Huron villages in the vicinity of Lake Simcoe (near present-day Toronto). They then continue their invasion deeper into Huronia; by May 1, they have destroyed all the Huron/Wendat villages, and killed a large part of the Huron population. The Huron/Wendat survivors retreat to a barren island in Georgian Bay. Many of them die of starvation the following winter; the survivors flee to Quebec in the spring. Denmark becomes the first western country to outlaw the slave trade. The My Lai Massacre. American soldiers slaughter hundreds of unarmed civilians in the Vietnamese hamlets of My Lai and My Se. Most of the victims are women, children, infants, and elderly men. Many of the women are raped, and then mutilated after being killed. The U.S. military first covers up the event, as it routinely does in the case of war crimes. When news leaks out eighteen months later, it claims the deaths occurred during a fierce firefight and lies about the number of dead. Eventually under intense public pressure, the army charges 26 soldiers, and then acquits all but one. The only man convicted, Lt. William Calley, serves a three-and-a-half year sentence – under house arrest in his own house. Noam Chomsky writes: “this was no isolated atrocity, but the logical consequence of a virtual war of extermination directed against helpless peasants: ‘enemies’, ‘reds’, ‘dinks’“. Iraqi forces attack the Kurdish village of Halabja with poison gas, killing about 5,000 people, mostly women and children. This is part of Saddam Hussein’s al-Anfal campaign, in which more than 2000 villages and towns are emptied and levelled and tens of thousands are killed. Rachel Corrie, a member of the International Solidarity Movement, is killed by an Israeli military bulldozer while attempting to stop the destruction of Palestinian homes. 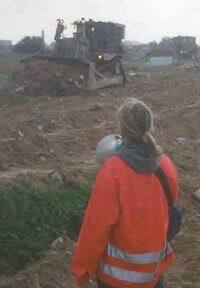 Further Reading: Rachel Corrie Presente!